Oakland Raiders tickets and travel packages are now on sale with PRIMESPORT, the Official Fan Travel Partner of the Oakland Raiders. Your Raiders will take on the Chicago Bears in London in 2019. Take your Raiders pride to the next level this season with an Official Raiders Fan Package from PRIMESPORT. 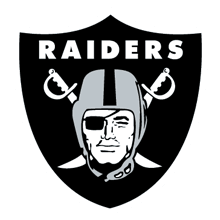 Sign up for Oakland Raiders game information! PRIMESPORT has teamed up with the Raiders for a great offer available to those silver and black fans looking to attend a home game on the 2019 Raiders schedule. Browse the list of home games at Oakland Coliseum. Enjoy the relaxed and comfortable diner environment with other Raiders fans before kickoff with fantastic food and drink selections before a short walk to the stadium. Support the team on the road this fall as the Oakland Raiders travel to London for the NFL International Series to take on the Chicago Bears. The Raiders are proud to offer a variety of Official Raiders hotel travel packages for this incredible experience, complete with hotel accommodations, Raiders tickets, pregame party admission, transportation to the stadium, and souvenirs, these packages can also include London tours and a fan welcome event. PRIMESPORT is Official Fan Travel Partner of the Oakland Raiders. The terms NFL® and Super Bowl® are trademarks of the National Football League. PRIMESPORT is a division of On Location Experiences.